I went to US for higher education in 1974 and came back to rural India in 1981. This is the story of my experiences in America in 1970s both as a graduate student and as a faculty. America in 1970s was a very nice, open and courteous society and I really enjoyed the graduate student experience. I have tried to capture it as best as possible based upon my 30 year old memories. If an event or names of people and places have been wrongly depicted then I apologize for the mistakes and blame it on my failing memory rather than any intentional misrepresentation. As one grows older there is an urge to pen down the experiences that have shaped ones life. My stay in US was one such experience. It has been little more than 25 years since I came back. In late 1981 when I returned, rarely any Indian with an IIT degree came back. Even the few who did come back went to big cities like Bombay, Delhi, Bangalore etc. I went straight to rural Maharashtra which was as alien to me as any foreign country since I hardly knew the local language or the milieu! More so since I had mostly spent my life staying in cities in Northern India. Why did I do it and was it worth it? This is the story which I have tried narrating in the epilogue. This is also the story of my self-discovery and I have always thanked the higher forces for giving me a place in rural Maharashtra - no matter how small - where I could think deeply on different issues, reflect on them and write about them. I really thank my wife Nandini and my younger daughter Madhura who went through the narrative with a fine tooth comb. Many thanks are due to Mr. Sanjay Aherrao for typing innumerable versions of the draft. The desire to go to US was kindled in me in my 9th standard. St. Francis High School in Lucknow where I studied from 3rd standard to Indian School Certificate, used to show regular documentary films from various consulates every month. Occasionally they would get a film from Lucknow United States Information Service (USIS). I remember very vividly that once a USIS film on 1964 New York International Fair was shown. I was dazzled by what I saw in the film since it was a show case of all the latest gadgets of modern life. Similarly another USIS film was about a train journey from New York to San Francisco as it went through the breathtakingly beautiful landscape of US. Both these films made a tremendous impression on my young mind. Similarly when I was in IIT Kanpur (IITK) I used to regularly see films at USIS whenever I came home to Lucknow for vacation. Quite a few of these films were about rockets and US space program of 1960s. All these films created a desire to go and visit this great country. Besides I always wanted to be a teacher and knew that without getting a Ph.D. good teaching position will not be available. In 1972 during my last semester in B.Tech in IIT Kanpur I had applied to quite a number of universities in US for graduate studies. I forget the exact number, but it was about 10 or so. I got admission in a few of them (without aid) including University of Florida, Ohio State University and a promise of aid from Marquette University. However, nothing substantial materialized so I decided to take admission in M.Tech at IITK only. In those days (1972) going to US was not easy, since IIT was still not a brand name and American Universities had not opened up to a large scale influx of India students as they did later on. Even though some of my seniors from IITK were in good schools like MIT, University of California, Berkeley, Stanford University etc., getting into them was not very easy. Besides in 1972 it was very difficult to get any information regarding schools and colleges in US since it took about 2-3 months to get a reply to ones queries from US universities. In our IITK library there was only one book on graduate studies in US universities and colleges and it was continuously checked out. Even if you got it after great difficulty, there were quite a number of pages torn out of it and so one never knew which colleges or universities were missing from it. Applying to US universities was not cheap. The application fee for every College or University was about US $ 10. So when we applied we gave all sorts of excuses for not paying this fee. Some of the clever students wrote beautiful essays detailing the poverty in India and how with tremendous shortage of foreign exchange they were unable to pay the fees. Nonetheless all of us used to write that if selected we would send the fees. Most of the universities bought into this story. Later on when such essays started pouring into the US university system on a large scale they got wiser and stopped accepting applications without fees. In such a scenario I therefore decided that I will do my M.Tech in IITK and then apply to the US universities. In June 1974 I was in the final stages of finishing my M.Tech in Mechanical Engineering and even then there was no hope of getting into US though I had received a few admissions without aid. Meanwhile I had befriended two American professors, one from University of Michigan, Ann Arbor and the other from University of California, Berkeley. Both of them were visiting IITK for varying lengths of time and thus I came to know them well. They both agreed to take me as a graduate student if I applied. In any case such an event never happened since a golden opportunity of getting Government of India national scholarship for study abroad appeared. One of my senior colleagues in Mechanical Engineering had received the national scholarship. These scholarships were introduced by the Ministry of Education, Government of India to help needy students to go to U.K. or US for their Ph.D. in cutting edge areas of engineering and other sciences. These were very handsome fellowships which gave to and fro airfare plus a princely monthly stipend of US $ 250/month plus the entire course fees. I applied for the fellowship and lo and behold got a call for interview sometime in July. The experience of my seniors suggested that getting it will be a breeze because the largest numbers of students chosen were from IITs. However, I had not yet finished my M.Tech and the call letter clearly stated that the M.Tech certificate has to be presented at the time of the interview. In any case I took a chance and went for the interview. During my M.Tech I had become extremely interested in Solar Energy utilization. My M.Tech thesis was on development of a novel solar collector. With the OPEC crisis of 1973, solar energy had become a hot topic in the west specially US. I read almost everything on it from the material available at IIT Kanpur library. Based upon my readings I wrote my first editorial article in 1973 on latest developments in Solar Energy in Hindustan - a daily Hindi newspaper published from New Delhi. This timely article was published immediately and brought in good amount of fan mail. I wanted to do further research in Solar Energy. In this connection I had already corresponded with quite a number of major US universities which were doing R&D in Solar Energy and all of them had advised that I should work with one Dr. Erich Farber in University of Florida (UF), since he seemed to have done maximum work in developing useful and working devices running on solar energy. I already had an admission from UF but without aid. And so the National Scholarship interview letter was like a god sent opportunity to go to US. So I arrived at the appointed time of 9 a.m. for interview in Shastri Bhavan, New Delhi where the Ministry of Education had its office. The office clerk asked for my M.Tech certificate and when I told him that I will get it in a few days since I had already submitted my thesis but the date of defense had not yet been announced, he simply said that my application was rejected. Even my explanation that M.Tech defense in IITK is an internal matter and is done very rapidly, did not cut any ice, because he did not know anything about these matters. Being young and impetuous I told him that he had no authority to reject my application and should consult the committee members regarding it. In fact I asked him who the committee members were and he refused to divulge their names. The only concession he made was to give me the name of the chairman of the committee. I felt my explanations and sternness may have had some effect since he went to the committee with my application after underlining heavily by red pencil the clause that I did not have the M.Tech certificate. After 10 minutes he came out of the meeting room and told me that the committee has rejected my application and what was more no traveling or daily allowance (TA/DA) for coming to attend the interview would be paid to me! In this hour of crisis when my whole life seemed to go down the drain, getting TA/DA was the last thing on my mind. Yet I was amazed at the bureaucratic efficiency of that clerk who had thought of all issues including TA/DA! I still remember those words clearly because they sounded a death knell to all my dreams of getting an American education. I felt extremely dejected. Nevertheless in such times the mind races very fast so I tried to find out whether anybody could influence the committee members to at least interview me. I was very sure that if I am allowed the opportunity to give the interview then I will be selected. I had tremendous faith in my ability to convince the committee of my candidature and was also prepared to give in writing that I will present my M.Tech certificate in 10 days time. Suddenly I realized that one of my distant uncles Dr. Atma Ram, who was an ex-Director General of CSIR and a very well respected name in the scientific community, might know the committee chairman. Dr. Atma Ram used to live on Dr. Rajendra Prasad Road about half km from the Shastri Bhavan. So I rushed to his place (almost ran) and told him about the whole thing. He said that he would call the chairman since he knew him well and that I should go to the interview venue. I somehow felt that Dr. Atma Ram might not have the influence that he implied he had, so I should search for some other source. Then I went to the house of my father's friend Shri. Sunder Lall. Shri. Sunder Lall was a Senior Congress M.P. and used to live in Canning Lane - quite a distance from Shastri Bhavan. Sunder Chachaji (uncle) as I used to call him listened to my predicament and thought for a few minutes. He then dialed a number and told me to go and see one Mrs. Rohan Lal Chaturvedi, the wife of another senior congress M.P. who was also a junior minister in Mrs. Indira Gandhi's cabinet. I immediately rushed to Mrs. Chaturvedi's house and was met by her son Manoj Chaturvedi. He was quite a talkative person and started chatting with me. It was nearly 12:30 p.m. and I was getting nervous since the interview time was slipping. I kept on reminding Manoj that I had to meet his mother but he kept on bypassing the issue. Suddenly his mother appeared and asked me who I was. When I told her who I was she reprimanded me by saying what I was doing there when I should have been in Shastri Bhavan and told me to immediately see the Secretary education who was the member secretary of the interview committee. I immediately rushed to Shastri Bhavan and waited till 2 p.m. outside the committee room when the lady secretary came out to meet me. I narrated my whole story to her and told her that I was ready to give an undertaking in writing that I will present my M.Tech certificate in 10 days. I must have talked to her for about 45 minutes, but felt that it made an impact on her. She told me to wait in the lobby and that I will be called for the interview at 5 p.m. Many a times it has happened to me that when the chips are down, there is a tremendous reserve of energy which comes in the form of either actions or words and has the desired effect of getting the work done. My 45 minutes talk was one example of that. I had not eaten anything that day because in such times hunger etc. vanishes. At 5.30 p.m. I was the last candidate to be called for the interview. The committee asked me some basic question on solar energy, but their tone suggested that I will be selected. So around 6 p.m. I went to Sunder Chachaji's house to tell him the day's events and after he listened to the detailed account he told me that I will be selected. From his tone it appeared that he knew much more than I did. I have therefore always considered my going to US as an act of God mediated though Sunder Chachaji. I have always remained grateful to him for changing the course of my life. Even after my return from US he helped me but then I am getting ahead of my story. That evening I took the night train (without reservation) to Kanpur. I have never worked so hard in my life as I did for the next 10 days and finally, I was able to clear my M.Tech defense. Getting the M. Tech certificate was another tricky matter since the babus in the IIT admissions office were as bureaucratic as you could find anywhere. So a small treat of tea and samosas in the local canteen did the trick. Those were the happy days when a small bribe of tea and snacks was sufficient to get the work done. I got my M.Tech certificate at 5 p.m. exactly 10 days after my interview and boarded the train that night for Delhi. For almost half of the journey, I had to stand in the general compartment. I reached Shastri Bhavan next morning and gave a copy of my certificate to the clerk reminding him how I was fulfilling my promise given in my written statement. He congratulated me to which I asked what was so great about the M.Tech degree. He said he was congratulating me on getting the scholarship! I hugged him and thanked him profusely and told him that I would like to take him out to tea, to which he replied that during duty time he cannot go out for tea! After getting the news of scholarship lot of work still needed to be done to get the passport, ticket, foreign exchange, visa, etc. Getting a passport in 1974 was quite a big affair and took an inordinately long time since a detailed police inquiry had to be conducted. I applied to the Lucknow Passport office (since we lived in Lucknow) for it and with the help of my father?s political connections got the passport in quite a short time. My case was also helped by the fact that I was a Government of India National Scholar which was quite a prestigious scholarship. Getting foreign exchange was another matter. In those times there were hardly any travel agents and thus I decided to do everything myself. It was quite a lot of work but somehow I enjoyed it because it allowed me to interact with the Government of India?s (GOI) bureaucracy. At that age one is not cynical and hence I took everything in stride as it came. The Reserve Bank of India?s regional office was in Kanpur so the foreign exchange of 250 US dollars that the GOI had given me was to be purchased from Kanpur. I filled out all the forms and deposited the necessary money. I thought that this paper work should be enough to get the foreign exchange since the official Government of India (GOI) letter was also enclosed. However after an eternity and explaining many times why I needed the exchange I was given the travelers cheques. I had never felt so much fear in my life as I felt after getting the cheques and they were put in the innermost pocket of the under garment. For my M.Tech I used to be paid Rs. 400 p.m. scholarship. With this scholarship I thought I lived like a king. I had two pairs of shirt and pants which were washed every Sunday and I used to see a movie in Kanpur once a month. Thus in two years of my M.Tech. I saved substantial amount so that I could pay for all the formalities of going to US like getting foreign exchange etc. In 1974 a US dollar was worth Rs. 8 and hence $250 did not amount to too many rupees. In fact after passing B.Tech I never took any money from my parents. To get all the paper work done for US I had to go many times to Shastri Bhavan, Delhi. I used this opportunity to really walk all over New Delhi. Delhi in 1974 was a beautiful city with hardly any traffic, broad footpaths and sidewalks and in September/October a very pleasant weather to walk. The fact that I was going to US filled me with tremendous emotions and happy feelings of how I was going to use my US education for the betterment of India. I cannot explain why I got these emotions. I still remember many of my friends remarking at that time that I talked of nothing else but India and its future. At the age of 24 the mind is at its peak and if it gets a boost by some positive event like going to US then it knows no bounds. I felt at that time that I could do anything in the world and nothing was impossible. This joyous and exuberant state must have been noticed by others also because in any government office work etc., I seemed to charm a lot of office babus with great effect! Thus for my air ticket I was given a letter by Shastri Bhavan for Air India. By this time I had become good friends with Mr. Sharma the same babu in Shastri Bhavan who had said that I will not get my traveling allowance (TA/DA). Since I was a part of the ?system? now, hence Mr. Sharma being a good GOI clerk would provide all the help. He was the point man who gave all different letters for passport, tickets, foreign exchange etc. Air India in those times (1970s) was one of the world?s best airlines (it is really sad to see what it has become today). Their main office in Delhi used to be in Connaught Place and was huge and very crowded. Armed with the letter from the Education ministry I went to meet the manager of Air India to get my ticket. I chatted with him quite a lot telling him about my desire and aspirations of using solar energy for betterment of India etc. etc., when on the spur of the moment he said that he will give me a ticket for helicopter ride from JFK airport to La Guardia airport. In those times all the international flights used to land at JFK airport in New York while the US domestic flights used to originate from La Guardia airport which is about 10 miles from JFK. Normally there were shuttle buses between the two airports. At that time I had no idea what the manager was talking about but later on I found out that the helicopter ticket is normally given to first class passengers. Since this was my first flight anywhere so I had no idea what was in store for me but was overjoyed to learn that besides the jumbo jet, I will also be traveling by a helicopter. During my visits to the Shastri Bhavan, Mr. Sharma the clerk used to be very surprised by my decision to go to University of Florida. He said many times that most of the national scholars go to top schools like MIT, Stanford, Berkeley etc. ?So why are you going to University of Florida? I have never heard of this university?, he used to ask. I used to explain to him that I was going to work under a world famous professor and the university name did not matter very much for Ph.D. He somehow was not convinced with this answer and said that I was making a mistake. By the time I got my air ticket it was already middle of November and the next item on agenda was to get the US visa. Also I was receiving regular mails from the University of Florida housing office telling me to please postpone coming in fall of 1974 since there was no campus housing available. In any case I was going in the winter quarter (starting from January 1975) since all the formalities of Government of India scholarship could not be finalized for fall quarter. So I wrote to the housing office at UF that please book a room for me for winter quarter. This letter was extremely helpful later on. My father being a well-known political figure in Uttar Pradesh (U.P.) politics was frequently visited by high-ranking US embassy officials. He was very close to Shri. H. N. Bahuguna who was a popular chief minister of U.P. and a strong candidate for future prime ministership of India. The US embassy staff recognized this and hence whenever they visited Lucknow they would meet my father. Besides he was a regular columnist in Hindustan - an influential Hindi daily paper published from Delhi by Hindustan Times group. My father?s editorial articles on political matters of U.P. regularly appeared in this paper and molded the opinion of important people in New Delhi. This was much before the crass commercial journalism that the present papers have come down to, so that the editorial columns of newspapers do not shape the opinions anymore. This is what brought Mr. Peter Thompson the first secretary in US embassy to Lucknow to see my father and they became good friends. So when the time came for me to get a US visa my father phoned up Mr. Thompson in Delhi who immediately agreed to help me to get the visa work done. On the appointed day I went to the US embassy and straight to Mr. Thompson?s office. In those times it was quite easy to go to the US embassy in Chanakyapuri, New Delhi. Nowadays it is a fortress and I am told that it is very difficult to go inside it. Peter had called me a little earlier since he wanted to talk to me and at the same time the appointment was kept somewhat flexible. I told Peter about my aspirations of learning solar energy and we discussed lots of things. Since Kennedy was one of my heroes in those days so I discussed the Kennedy clan. Peter was quite surprised by my readings other than engineering since he thought that IITians were nerds. In any case I remember discussing with him the issue of Nixon pardon and he was very emphatic that President Ford made a mistake in pardoning Nixon. I as an impassionate observer felt that some of the Americans were not forgiving and were very passionate about taking revenge. However I could see their point of view since the younger generation in those times was extremely polarized by Vietnam war which they thought was a part of Nixon legacy. Peter, at the appointed time, took me to the Consul General?s (CG) Office. I was asked to wait for a few minutes outside and I found that the gentleman sitting next to me waiting his turn was the attorney general of India. Though he had been waiting much before my arrival but because of Peter I was immediately called into the office of CG. The CG looked at my application, the I-20 of the UF and also the amount that I would be getting from the National Scholarship. If I remember correctly there was a shortfall of about $ 1500 or $ 2000 per year between National Scholarship that I would get and UF demand. So he asked me how I was going to make up the difference. I replied that the UF figures are for American students who live an affluent lifestyle, go to discos and party all the time whereas an Indian student with simple living will not require too much money for staying ! The CG glared at me angrily and I got the feeling that he would have thrown me out of his office but the situation was saved in nick of time by Peter Thompson?s intervention who suggested that since all the fees are being taken care of by the Government scholarship, the living allowance should be sufficient to survive. After coming out of the office Peter told me that I should not have said what I did, so the visa was really given because of Peter Thompson. My statement to CG was not really off the mark since I found out later on that the UF numbers were based on a student eating out in UF cafeteria which was much more costly than cooking at home. Thus I was easily able to save some amount every month even from my meager $ 250 monthly stipend which was eventually raised to $ 400/- within one quarter of my reaching Gainesville. In any case getting a US visa was very difficult in those times and I wonder whether without the help of Peter Thompson I could have gotten it. I am sure the consular staff would have insisted that the difference be made up by my family?s finances and with the precarious financial situation of my family it would have been very difficult to do so. As they say when things have to happen ways are shown by the forces to be. Peter Thompson was a very dynamic and bold man but was also slightly arrogant. His arrogance naturally came from the power of US government. After getting the visa we both went to the office of Shri. 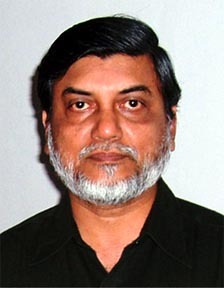 Ratan Lal Joshi the editor of daily Hindustan. Shri. Joshi was at one time a very close confidant of Mrs. Indira Gandhi and an influential figure in the New Delhi political scene. We were both invited by Shri. Joshi for lunch at his house. Ratan Lal Joshi and my father were in jail together during the 1942 freedom movement and were very close friends. So anytime I came to Delhi I would go and meet Joshi ji. He was an intellectual and a very soft spoken person and we enjoyed talking on all sorts of issues concerning energy and Indian affairs. When I told him about my getting the US visa and how Peter Thompson was helping me in getting it, he invited both of us for lunch. We reached Joshi ji?s office around 1:30 p.m. On entering it we found that Mr. Joshi was on the phone and he kept on talking for the next half an hour. Obviously Peter Thompson got really rattled and after Joshi ji finished talking he told him that he has information that Mr. Joshi will be soon removed from editorship of Hindustan! Mr. Joshi became extremely angry, livid and red in face and started telling Peter Thompson in raised voice that CIA agents can do anything. Peter who obviously knew what was coming could not tolerate the remarks and left without lunch. I pleaded with him to stay on but he refused to budge. I found out later that Peter was right and Shri. Joshi ji was eased out from his editorship in next couple of months. The main reason was that Joshi ji was perceived by Mrs. Indira Gandhi to be close to Shri. H. N. Bahuguna - her archenemy and a person considered to have engineered the famous Allahabad High Court decision against her in 1975 which ultimately led to imposition of emergency in India. How Peter and US embassy knew about it at that time is a mystery to me. I left India for US on 29th December 1974. It was my first flight anywhere and hence the excitement was too much. Not only my whole family, but friends and well-wishers came to see me off. I think about 10 to 12 people came to the airport to bid me farewell. In those times it was a big affair to see off people at the airport especially when one was going to US. At the security point in those days they used to check the baggage physically since the x-ray checking had not been developed. Since I was taking a couple of pair of shoes the rude security person remarked that all students going to US carry only shoes! He was quite an obnoxious and rude person and broke a pakad (potholder) that a British couple had bought to take back home. They had bought it in Chandani chowk and it was a very useful and novel item for them. The security man did not even have the courtesy of saying sorry. Going through security and customs at the airports in India in those times was quite a harrowing experience. By contrast it is a very smooth ride nowadays. The British woman was distraught and almost on the verge of crying. After we sat in the bus which took us to the aircraft, I tried to console her by telling her that not all Indians are as crude and impolite as this security person was. I apologized to her on his behalf. I was a proud Indian and felt that the foreigners should always leave with a good impression about India. When the Air India flight took off at midnight I cried. It was a strange experience for me since I always considered myself as a strong person but a tremendous love for India the motherland erupted within me. I vowed that I was going to US to learn technologies so that I could come back to use them for India?s benefit. I am still amazed even today about how that feeling came but it did come with a tremendous force. There was sadness in leaving my family behind but this overwhelming emotion for India was amazing. I felt that they were pangs similar to those felt by a newly married girl during Bidai! The Air India flight that took me to US on the cold night of 29th December 1974 had a couple of stops. The first stop was in Kuwait for refueling. The flight then went to London and finally to New York. Due to the excitement of my first flight and also the fact that I was going to US, I could not sleep at all in the plane. Even today, after traveling maybe millions of miles in planes, it is nearly impossible for me to sleep on them. So when I was not looking outside the window I chatted with my fellow passengers and the air hostesses. An Indian professor who taught in some US university befriended me. He was an elderly gentleman but we chatted quite a lot. Just before reaching London he asked me whether I was taking any liquor for anybody in US. I said no so he asked me whether I could take an extra bottle for him. In those times every passenger was allowed to import only one bottle of liquor in to US so getting an extra bottle was a good deal. At the London airport he bought two bottles of Chivas Regal at the duty free shop of which one bottle I had to carry past the US customs in New York. Then I realized why he was so friendly to me. In any case this allowed me to see the dazzling display of duty free shops in London Airport and also found out that Chivas Regal is a prized whiskey and a good present for somebody who drinks. While approaching London airport strange thoughts came to my mind regarding our old history of colonial rule by British and how they had raped and plundered India. These thoughts never came later on when I traveled many times to London but the first visit brought them as if they were a part of greater consciousness of India and I was an integral part of it. My Air India flight was to New York's John F. Kennedy (JFK) international airport and from La Guardia airport I had a domestic flight on Eastern Airlines next day to Gainesville, Florida. I was a fast learner and so learned quite easily how others behaved and tried copying them. Thus I had no difficulty at the immigration or customs in New York though this was my first visit. Just before landing at JFK in New York, I had befriended another Indian professor who was a thorough gentleman and felt very happy that a new Indian student was coming to US. He told me never to go back to India since US was a land of opportunity and offered a great future. He also sensed my apprehension regarding immigration and customs and getting my flight for the next day. Hence he told me how to behave with the customs and immigration officials. Since he was also traveling by the helicopter service to La Guardia he helped me take the shuttle and showed me all the landmarks of New York as we flew from JFK to La Guardia. It was a fantastic sight to see so much brightness at night and even today when I think about that journey it brings back wonderful memories of that amazing sight. When we reached La Guardia airport the gentleman professor (whose name I cannot recollect now) asked me where I was staying during night. I told him I had no place to go to at which he was very surprised. He told me that loitering in the airports is strictly forbidden and if the cop or police finds out about it then he will force me to leave the airport. In any case the professor found out that till midnight or early morning there will be flights to and from La Guardia so if I just show that I am waiting for some flight I will be all right. He also helped me by putting my only suitcase in the airport locker and gave me the key. In those times the lockers at airport required 2 quarters and he give me 2 more quarters in case I needed my bag and wanted to put it back again. He assured me that everything will be alright and left his visiting card with me. It was a wonderful and a warm welcome that I felt because of the generosity of this Indian professor. I had reached La Guardia at 8:30 p.m. and my flight to Gainesville was at 7 a.m. next day. So there was nothing else to do but to see America as it passed by in La Guardia airport. From lack of sleep, excitement and probably the excellent and rich food in Air India flight I got slight indigestion. So a couple of times I went to the restroom. This was the first time I was using the European toilet and not being used to them I squatted on it. The American toilet doors are open from below and hence anybody can see the legs of a person inside. So whenever anybody came to the toilet, I would get down and this program continued for sometime. After I came out of the toilet, I washed my hands and as per my usual habit I took out the handkerchief from my pocket to wipe them. A black passenger who was standing at the next wash basin washing his hands, immediately said 'Man take the paper it is free'! I laughed at his remarks because he thought that a poor Indian might be afraid of taking the paper towel thinking it might cost money! We chatted for a while and then I requested him to have coffee with me. So my 50 cents that the Indian professor had given me were used up. The scene at La Guardia airport was amazing. It was New Year's Eve so it was quite crowded. I saw for the first time the openness in American society where they would do anything in public. Thus some couples were kissing really passionately and except for actually making love they did everything openly. For a young man coming from a prudish and conservative society like India this was quite a revelation. In those times La Guardia had sofas in the waiting halls. So I found a sofa close to where my luggage was stored and tried to lie down on it. Since the Indian professor had warned me not to sleep, I kept an eye for an occasional cop. Anytime I saw a cop I would get up, sit and pretend to read and when he went away again lied down. This is how I passed the night. By the time morning came I must have slept for not more than one hour or so and thought that on reaching Gainesville I will sleep. I had no idea where I will be staying or how will I reach the dorm that I had asked for. These things I thought will somehow be taken care of when I reach Gainesville. I also thought that if the higher forces have allowed me to come so far they will also show me the way. In the morning after freshening up I went to collect my luggage from the locker and was quite happy to see that it was still there! Coming from a country like India where one is always afraid of thefts in lockers it was a new experience that it was intact. The flight from New York to Gainesville was by a small jet plane of Eastern Airlines. I again asked for the window seat so that I could see how US appeared from the sky. I befriended my fellow passenger. He was a Chinese student doing his Ph.D. in electrical engineering. So I must have asked him millions of question regarding University of Florida. He assured me that electrical engineering was very good but was non committal about mechanical engineering. When I asked him about Dr. Erich Farber he said that he had not heard of him. My heart sank and I wondered whether I had made a mistake of coming to UF. As we approached Gainesville, I looked out and did not see anything except trees. We landed on a non-descript airport which was even smaller than the Lucknow airport and in those times Indian airports were a laughing matter. The porter brought out our luggage from the plane in a hand trolley and told us that we should pick it up ourselves from it. In early 1970s Gainesville was a small university town with student population of about 28,000 and the total population of about 130,000. There was hardly any industry and very little commerce except what the university community generated. This was the reason for a very small airport and very few flights per day. In contrast today Gainesville has become a fairly large town with student population of nearly 46,000 and huge shopping malls and large housing complexes dotting the city. Besides it is consistently rated as one of the best cities in US to live in. At the airport gate an elderly gentleman and his wife greeted me. I guess I was the only Indian on the plane so he recognized me immediately. The elderly gentleman was a retired University of Florida professor in nuclear engineering and he and his wife had volunteered to pick me up at the airport. Long ago I had written to the International student office that I did not know anybody at UF and if somebody could pick me up from the airport then it would be appreciated. Hence it was very sweet of them to come to the airport on New Year's eve. The first thing the professor told me was that I probably needed some good sleep. He must have figured out from my blood shot eyes and disheveled appearance. He enquired about where I would be staying and when I told him that I have not heard anything from the UF housing he drove me straight to the International student office. The day was 31st December 1974 which was a Tuesday. So there was not a soul in the university since it was Christmas vacation. Still the head of the International student office Ann Corbin - a very charming lady was there probably waiting for my arrival. She was very helpful and phoned a couple of Indian students. But being a holiday season nobody was around. After many tries she located an Indian student who had come from out of town and was staying as a guest in one of the apartments. Ann thought that either on 1st or 2nd January, I should be able to go to the housing office and find out about my staying arrangement hence I could stay for a day or two in that apartment. So the professor and his wife deposited me around noon at this apartment which was about three miles from the University. The Indian visitor greeted me and after a quick hello I immediately took bath and almost broke my bones by slipping in the bath tub but luckily nothing happened. After taking bath and freshening up, the Indian student and I went to the nearest place to eat. I was really hungry since I had not eaten in the last 10-12 hours because I did not want to spend money on food at the N.Y. airport. Though I was hungry and quite sleepy still the first impression I had when I walked from the apartment to a nearby restaurant was of tremendous silence. Though it was a holiday season and hence there were fewer cars on the road, none of the cars honked and there was very little noise otherwise. This was a tremendous contrast to my surroundings in Lucknow and Delhi where the noise pollution was quite heavy and where nowadays it has become a major epidemic. We went to Steak and Shake which offered mostly beef and chili and this was my first meal in US. For an almost vegetarian from India this was a strange introduction to America. After that I came to the apartment and slept. This was about 1 or 2 p.m. and when I woke up at 11:30 p.m. I heard strange noises coming from the living room. The owner of the apartment, an Indian graduate student, had returned from his vacation and was watching American football on his TV. I introduced myself but was surprised by the lack of interest this Indian student had in me. He had been in Gainesville for almost 4 years and had very little interest in anything Indian. As a matter of fact he told me that I should look for another place to live since other roommates of his were coming next day. Since I was still feeling groggy I went back to sleep and woke up in the morning feeling quite fresh. In the morning the other roommates (all Indian students) came and the one in whose room I had slept told me bluntly that I had to move out. He suggested that I should look at the advertisements in the local paper Gainesville Sun and then call the phone numbers given in them. I called one number and the voice at the other end could not understand my English so I realized very fast that hunting for apartment this way would be a futile exercise. By this time I had found out that one of my IIT Kanpur classmates Udai Pratap Singh was living and working in Gainesville. Udai and I hardly knew each other in IITK and just had a passing acquaintance. But in this foreign land both of us met like long lost friends. He immediately told me to move in with him in his apartment till I found a place. However I thought it might be better to first find out what the status of my campus housing was. So next morning I went to the housing office on the university campus. The office was about 2-3 miles from the apartment and since it was winter and a very pleasant weather I walked to it. I was therefore very surprised that every 2 or 3 minutes a motorist would stop and ask me if I needed a ride. I was really touched by their generosity and thanked them. In those times walking in US was quite a rarity and most of the times people either rode a bicycle or drove a car. Gainesville had a nearly non-existent bus system and so it was difficult to get around the town. I enjoyed walking and loved the green surroundings. The present US is a very different place and if you are walking nobody will ever ask you if you need a ride. On reaching the housing office I asked the lady at the counter whether I could get an accommodation on the campus. She said everything was full and could help only if she had received a request before hand. I told her that sometime in September I had sent a letter and I was not sure whether it had been received since I never got a reply. She went back into the records office and fished out my letter and said that yes housing would be available to me in the Beaty Towers. I was so thrilled by this news that I almost hugged the lady. Beaty Towers which was next to housing office was for graduate students and the costliest dorms on the campus. If I remember correctly it was $ 175 per quarter and I had little more than $ 200 with me. Besides I had to pay 100% advance and did not know when I would get my monthly stipend from the Indian embassy since all the cheques came from there. However the rude welcome that I had received from the Indian students in the apartment where I had spent the first two nights made me take the decision immediately and I took admission in the Beaty Towers. My friend Udai told me that till I got my cheque from the Indian embassy he would loan me money for the groceries and other things. So that evening after Udai came back from his office I got my luggage from the apartment and moved into Beaty Towers. Beaty Towers apartments were cramped but a luxurious place to live. Each apartment which was centrally air-conditioned had 2 rooms, a dinning/kitchen area and an attached bathroom. These apartments were meant for 2 students with one in each room, but because of shortage of space it housed 4 students, 2 in each room. Since it had a modern kitchen and a refrigerator, I had to buy some utensils to cook. The rest I borrowed from my roommates later on. Since it was still the holiday season, I was the first to arrive in my apartment and did not know who my roommates were. At around 12 midnight I was woken up by this hunk of a man who was very tall and spoke with a thick European accent. I was still too sleepy and so said good night to him and went back to sleep. Next morning I found out that my new roommate was a Romanian graduate student in Chemistry and that his father was the second in command to the President of Romania. We became very good friends and he felt a certain kinship to me since he loved Raj Kapoor movies and I was a foreigner. He hated America. To him any day a foreign roommate was desirable to an American. I used to argue with him that if he did not like US then why he was staying in that country to which he could never give any satisfactory reply. I found this tendency in quite a few foreign students I encountered during my stay in US. They all criticized US but never wanted to leave it. The Romanian roommate used to be visited occasionally by dark suited characters who seemed to be KGB - type operators. They brought crates full of Vodka since he used to drink heavily. Whenever I broached the subject of his visitors he would simply ignore my questions. I lost touch with him when I moved to Reid Coop in the next quarter. However I was told that he had abruptly left UF without a forwarding address. Next morning I went with tremendous eagerness to my department. This was my first day on a US university campus. The winter quarter had started and so there was quite a lot of activity and crowds at the campus. Everything was new and unique to me and so I soaked up as much experience and sights as possible. I reached the department office, finished the paper work and then went to see my professor Dr. Erich Farber. I was really touched by the extreme politeness and helpfulness of the Mechanical Engineering office staff. In fact US of 1970s was a very polite and gracious society. Some of the rudeness that has crept in now came much later on. I was told that Dr. Farber will come later on in the day. So I waited and when he came I went to his office and introduced myself. I asked him whether he had received my letter regarding my coming to work under him to which he replied that he got 200 letters every day so was not sure which one was mine ! This was my first brush with his arrogance and I had many opportunities to experience it later on during my UF stay.